Since the geared axle is the actual applier of motion to the locomotive, I suspect you picked the wrong axle. I’m not sure about that – all three axles are driven. One through the gear, the other two through the side rods. In any case, I’ll try applying the goop to a different axle if a second application on top of the first doesn’t help. Trevor. 1) any way to add some more weight? 2) can you build a flexichas type system if one does not exist? 1 – no. The boiler is already packed, including a second speaker and the decoder itself. 2 – no. Beyond my capabilities. And not worth the trouble. As I noted in my posting, this isn’t a big issue for me, since the Moguls have no trouble with the train. It’s certainly not as big as having the passenger cars derail, which they did before I compensated the trucks on them. If I continue to have trouble with the 10-wheelers and their haulage capabilities, I’ll assign them to freights and assign Moguls to the mixed trains. 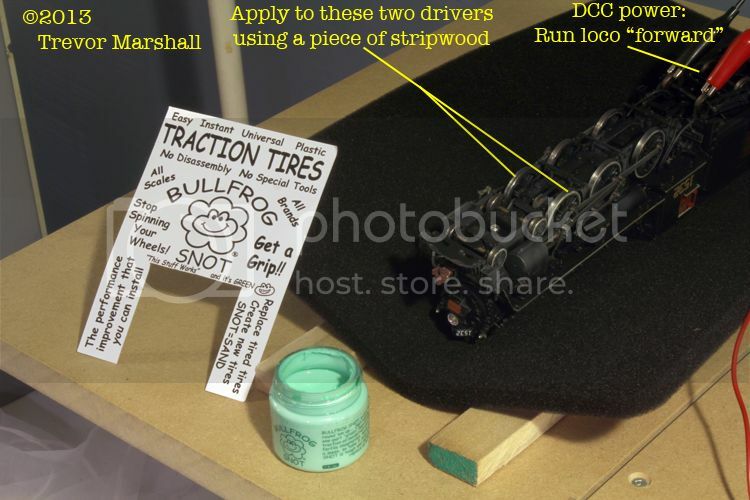 Can you put hat shaped bearings into the equalizer frames on the passenger truck? I suspect that the wood is not the best available bearing. Just a thought. It’s a good question. Not really. And the wood should be fine. There’s not a lot of it bearing on the axle. I’ve soaked some graphite (Neo Lube) into the wood to see if that helps. Adding hat bearings is beyond my skill level – and I’ve gone looking for such things in the past without success. I’ve found plenty of them online from UK suppliers – none of which has answered my inquiries. 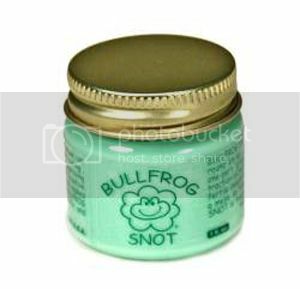 I wonder if the Bullfrog goop might transfer to the rails and inhibit connectivity thereby making it necessary to clean the rails more often??? I don’t think so. It sticks to the tires very, very well and once it’s cured it should be fine. I don’t have any trouble with electrical pick-up – even with two tires gooped, each of these little locos has 12-wheel collection. Any concern about the snot buildup on the drivers causing tracking problems? I would have put the ‘snot on the rear set of drivers first. I also suspect that differences between the two loco’s, assuming that they are the same total weight, could be as result of centre of gravity differences or how much weight bears down on the front truck.